We often eat meatless at our house. Many vegetarian and vegan dishes pack so much flavor, we never even notice the absence of meat. 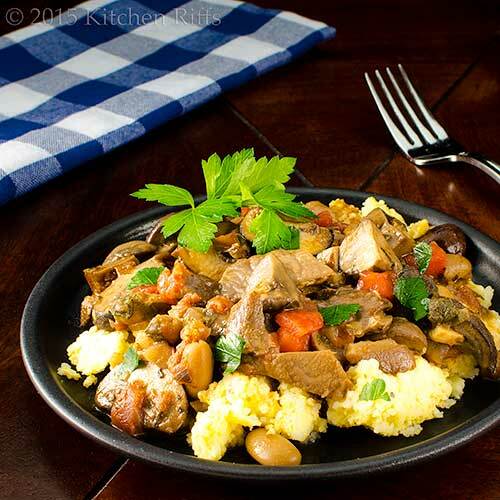 This mushroom and white bean ragout is a good example. Portobello mushrooms offer plenty of “chew” and savory flavor. White beans add protein. Dish it up over polenta or noodles, and you have a one-dish dinner. Best of all, you can make this ragout ahead of time—it reheats beautifully. We’ve served this dish to company, and it always gets rave reviews. So be prepared to take a bow. Mushroom ragouts are common dishes throughout Northern Italy and much of the Mediterranean region, where they often are made with wild local mushrooms. We use Portobellos because they taste great and are readily available. To add some extra flavor, we also include dried porcini mushrooms. But if you have access to wild mushrooms, they would be spectacular in this dish. We like to serve this ragout over polenta, particularly our Easy No-Stir Oven Polenta. But it’s also great over noodles or rice. Or even mashed potatoes (with lots of butter if you want to go all decadent). This recipe was inspired by one we found in Martha Rose Shuman’s Mediterranean Harvest. Prep time for this dish is about 10 minutes, with total cooking time adding another 45 minutes or so. The ragout keeps for 3 or 4 days if refrigerated in an airtight container. Reheat it on the stovetop over low heat. Place the dried mushrooms in a heatproof bowl or measuring cup. Add the hot water and let the mushrooms soak for 30 minutes. Then place a strainer over a bowl and pour the mushrooms into the strainer. Squeeze the mushrooms over the strainer until you’ve squeezed out all the juices. Quickly rinse the mushrooms to remove any residual sand. Chop the mushrooms coarsely, then set them aside. Measure out 1½ cups of the soaking liquid (strain out any sand) and set aside. Prep the Portobello mushrooms: Wipe the mushrooms with a damp paper towel (or if they’re particularly dirty, rinse them quickly, then dry). Remove the stems if you wish (we usually don’t) and cut the mushrooms into slices of ½-inch or so (if they’re small, you can cut them into halves or quarters). Set aside. Peel the onions and cut them into dice of ½ inch or so. Place a large frying pan or Dutch oven over medium stovetop heat. When it’s hot, add olive oil. When the oil is heated (it’ll shimmer—this takes 15 seconds or so), add the diced onions. Season to taste with salt—maybe a couple of big pinches. Lower the heat a bit and sauté until the onions are translucent—typically 5 to 8 minutes. Meanwhile, peel the garlic and slice it thinly or mince finely. Divide the sliced garlic into two heaps of roughly equal amounts, then set aside. Once the onion is translucent (Step 3), add half the garlic. Add the dried thyme and fresh rosemary. Sauté the onion mixture for 1 minute. Now add the Portobello mushrooms (from Step 2). Add additional salt to taste (maybe another couple of big pinches), plus the butter. Sauté the mixture for 5 minutes. Add the flour if using. Cook for 2 minutes, stirring frequently. Add the reconstituted mushrooms (from Step 1), along with the wine. Cook the mixture down until the liquid evaporates and a glaze forms on the mushrooms. Stir from time to time so the mushrooms don’t stick and burn. While the wine is cooking down, open the can of beans, dump into a strainer or colander placed in the sink, rinse off the gunk they were packed in, and let drain. Add the reserved soaking liquid (from Step 1), along with the beans, the tomato, the reserved garlic, and the parsley. Bring the mixture to the barest simmer, and cook for 30 minutes (a bit longer is OK). Taste, then add salt and black pepper (if necessary). Serve over polenta, rice, or noodles. Garnish with chopped parsley or fresh rosemary. We often sprinkle on some grated Parmigiano-Reggiano as well. What’s a ragout? It’s simply a dish, usually containing liquid, that’s cooked over low heat. Sort of like a stew, but not exactly (stews typically contain much more liquid). A ragout can contain meat, or it can be made entirely from vegetables and other ingredients. If you can’t find (or don’t want to use) dried porcini mushrooms, you can substitute any type of dried mushrooms that you prefer. We do recommend using some kind of dried mushroom, though. They add wonderful flavor, and their soaking liquid provides savor. If you can’t find (or don’t want to use) Portobello mushrooms, you can substitute regular white or cremini mushrooms. The flavor won’t be quite as good, however. Shiitake mushrooms would also be a good substitute. Red wine works best in this dish (for Step 8), but white is fine too. If you don’t want to open a bottle of wine just to make this dish, you can substitute dry vermouth (the white stuff; red vermouth wouldn’t work at all). Cooking removes almost all the alcohol from wine, but be aware that a small residual amount remains. So if this is a concern, just skip the wine—the dish will still taste quite good. If you don’t have fresh rosemary for garnish, use more thyme or perhaps substitute dried sage. Dried rosemary isn’t worth using, in our opinion (the stuff tastes awful). We add flour in Step 7 to help thicken the sauce. Cooking it for 2 minutes eliminates the “raw flour” flavor. If you don’t want to use flour, you can eliminate it—the sauce will just be a bit more runny. Or substitute cornstarch: At the end of cooking, add a tablespoon or two of cornstarch to a like amount of cold water. Stir to combine, then stir the cornstarch into the ragout right before serving. This will also help thicken the sauce. Although beans and tomato add a lot to this dish, you can leave out one or both if you wish (neither is in Shulman’s recipe). In fact, most of the recipes we’ve seen skip these ingredients. “And when it comes to cooking ‘shrooms, you’re a champignon,” said Mrs K R.
“Maybe we should put a cap on this conversation,” I said. “Yeah, before it mushrooms into something,” said Mrs K R.
Hi Beethoven, haven't heard from you for awhile! This is a terrific dish -- you'll love it. As will your cook. :-) Thanks for the comment. Continuing the polenta kick, still have to make some. I was sure there was meat on the picture, the beauty of portobellos : makes a meaty like dish. Great ragout . Thanks for the recipe! Mushrooms are always a good replacement for meat! Love the mix of both dried and fresh in your ragout. And one can never go wrong with beans. :) Lovely dish John! The ragout looks amazing. I love anything with mushrooms in it. Hi Nee, don't Portobello mushrooms have so much flavor? I need to try them in burgers! Thanks for the comment. Hi Evelyne, we just can't get enough polenta around here. ;-) Love Portobello mushrooms -- you really don't miss meat when you use them. Thanks for the comment. Hi MJ, we add beans to everything! So much flavor, and loads of nutrition. Thanks for the comment. Hi Pam, it's a great dish. And don't mushrooms have so much flavor? Love them! Thanks for the comment. What a great recipe and perfect for those nights we really don't want meat but want to feel satisfied. I love this recipe John, I'm a true believer when it comes to mushrooms, and with the scary news lately about how bad meat can be for us, I'm all over this! This looks delicious. I like that it can be prepared ahead of time. From time to time we enjoy meals without meat and this looks perfect for one of those evenings. Hi John, I bet this is delicious served over polenta, this is my kind of dish. Hi VIcki, isn't this nice? Really tasty stuff! Thanks for the comment. Hi Sue, we still eat plenty of meat, but really do like a lot of vegetarian recipes. And this one is just excellent -- most people will really like it. Thanks for the comment. Hi SG, this is really a good meatless meal. I started making it to serve people who didn't eat meat, but now make it just because it's so good. Thanks for the comment. Hi Cheri, my kind of dish, too! And goes really well with the polenta. Thanks for the comment. I always thought that a "ragout" was a fancy name for a stew - I had no idea that a ragout differed from a stew by the amount of liquid it contained - thanks so much for that info! This ragout sounds so flavor full - love the 2 kinds of mushrooms in it! I love the meaty texture of portobello mushrooms. I love how you incorporated white beans into it. Amazing dish. I don't think anyone would miss meat with those flavors and textures. I love that you made this with mushrooms instead of beef. We've been cutting down on the amount of red meat we eat and this looks like the perfect dish! Mushroom liquor always adds a wonderful flavor to dishes. This sounds like something my family would love too. We are doing more and more meatless meals. I can't wait to add this recipe to our list. I'm not a fan of tomato sauces, so mushroom ragouts like this are my favorite. They are so hearty. I could eat this like a stew. Another spectacular recipe from Kitchen Riffs! I love this dish as I love to eat meatless meals. The photo looks so inviting and yummy! I love ragouts and like you said it is not like a stew, that has more liquid. What makes this one so good is the mushrooms..love the porcini and the portabella. It does give the dish more savory and hearty flavors. I think I would love this especially over the polenta...Great job and I am printing this one out to make sometime. Thanks and have a great week..say hello to Mrs.K. Riffs...Love the last two lines.."a cap on the conversation, and stop before it mushrooms"
I am in awe of your repertoire of recipes with white beans, John. This is another cracker of a recipe. Thanks for sharing! 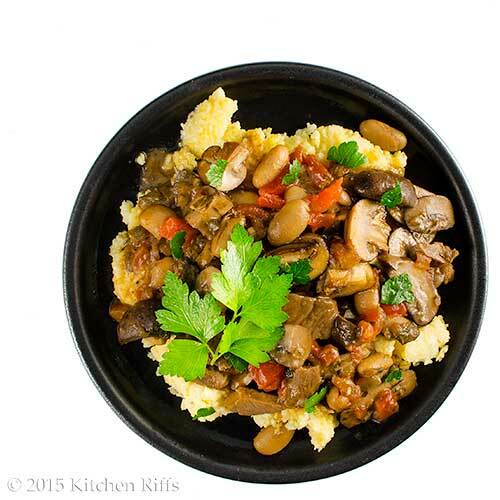 I love mushrooms and this ragout, packed with flavor and with a wonderful touch of fresh herbs is a must try. Thanks for sharing this amazing, Mediterranean inspired dish. A hearty, superb dish that I would devour all by myself. Hi Shashi, that's one rough -- very rough! -- way of distinguishing between a ragout and stew. Whatever you call this, it's a wonderful dish! Thanks for the comment. Hi Ansh, I'll bet a lot of people wouldn't even notice meat was missing in this dish until it was pointed out to them -- it really has deep flavor. Thanks for the comment. Hi Pamela, this is a perfect meatless dish -- big flavor, but no meat. Thanks for the comment. Hi Karen, bet you'll like this! And making it is a good excuse to make polenta. ;-) Thanks for the comment. Hi Laura, you could eat this like a stew! But we like it with polenta or noodles. Mashed potatoes are awfully nice, too. Thanks for the comment. Hi Dottie, we can't resist those puns, can we? :-) Thanks for the comment. Hi Rocquie, bet your husband will adore this dish! It really has such fine flavor. ;-) Thanks for the comment. Hi LIzzy, I like cooking with white beans. Obviously. :-) Thanks for the comment. Hi Daniela, this is such a good dish! And you can probably change up the herbs and substitute something else if you like. Thanks for the comment. Hi Denise, this is a hard dish to share! Too easy to eat it all by yourself. :-) Thanks for the comment. Hi Juliana, mushrooms have such amazing flavor, don't you think? Very, very satisfying. Thanks for the comment. Hi GiGi, this is a wonderful dish! And you're right -- it's a hearty one. :-) Thanks for the comment. We had a meat free meal last night and neither of us missed a thing. When we first started eating meat free one night a week, John felt like he was missing something. Habits do change if you keep at it. I would love this mushroom and bean dish. I agree, adding FUNGI to a ragout is a great idea- I especially like golden chanterelle mushrooms, but they're hard to find. If only I could convince Mr. Rosemary that meatless meals can be wonderfully filling. Maybe I'll sneak this one in . . .
Wow, looks fabulous. Who needs meat for this one. Hearty and rich! Hi Maureen, we just happen to eat meat free a lot simply because there are so many great dishes that don't involve meat (think of all those wonderful Indian vegetarian dishes!). I'll bet you would really like this dish--John, too. Thanks for the comment. Hi Fran, we're always up for fungi! ;-) Golden chanterelle mushrooms are wonderful, aren't they? But I agree they're usually not that easy to source. Thanks for the comment. Hi Rosemary, seriously, I'll bet Mr. Rosemary would be halfway through dinner before he realized there wasn't any meat in this dish! This really is satisfying stuff. Thanks for the comment. Hi Lea Ann, this really is quite hearty! And rich! Our kind of dish. :-) Thanks for the comment. Check out the flavours you have going on in this! For this, seriously, I would not even THINK about meat. Thanks John! I'm loving this white bean recipe, looks like such a hearty and comfy dish. Yum! Hi Nagi, lotta flavor in this dish. Just the way we like it. :-) Thanks for the comment. Hi Mary, this really is a great dish. You're right -- very comforting. Thanks for the comment. I love this dish John - everything about it is comforting. I have never had wild mushrooms but do love the deep flavor of porcini. Served over your lovely polenta - it looks amazing. I should have eaten lunch first - so hungry now! Hi Tricia, sorry about that hunger thing! Good reason to eat before reading food blogs. ;-) Thanks for the comment. Totally rocks! I love dried porcinis. I always try to find someone going to Italy to bring me a giant bag back. Mine is now out which is a shame. 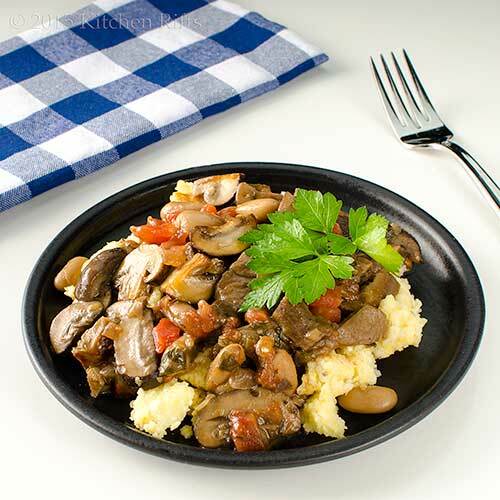 Love polenta and shrooms! You are a champignon! Hi Abbe, love being a champignon. :-) And this does rock. You need to get another big bag of porcini! Thanks for the comment. Hi Charlie, this is a champignon recipe! Bet your uni students would really like it. It's wonderful on polenta. :-) Thanks for the comment. I LOVE beans in dishes, they are such a comfort food for me. It's so funny, when I looked at the picture I thought it was a regular meat and bean casserole, I couldn't work out why you were saying it was perfect for a meatless Monday!! LOL! Hi Carolyn, I'll bet your husband would devour this too! TONS of flavor in this. ;-) Thanks for the comment. Hi Julie, beans taste so great, don't they? We love them! And this does look pretty meaty -- those are big chunks of mushroom, and the color they get from braising is awesome! Thanks for the comment. I love the occasional meatless meal!! Definitely making this soon! Hi Ashley, this really is a great recipe. You might find yourself eating meatless more often, just so you can have this! :-) Thanks for the comment. Hi Pam, mushrooms really are wonderful, aren't they? Terrific flavor, and so versatile. Thanks for the comment. I love a hearty and delicious meatless meal like this - straight up comfort food! Hi Amy, straight up comfort food is right! Thanks for the comment. This looks delicious! This looks like the perfect comfort food for the winter! Hi Cathleen, it really is great cold weather chow! So tasty. ;-) Thanks for the comment. Hi Liz, isn't this nice looking? This dish is a real charmer! Thanks for the comment. To think I didn't like mushrooms for years unless they were deeply buried in a dish. And what was the reason for that you may ask. BECAUSE Mom used canned mushrooms. GAK!!! And a lot of restaurants did too back when the world was flat. I love love mushrooms now and this is a great meatless meal for sure. Hi Carol, canned mushroom are scarier than the most scary Halloween goblin. ;-) Used to be hard to find fresh mushrooms back in the day, so canned was all there was. Thank goodness those times are a distant (very!) memory. ;-) Thanks for the comment. Hi Greg, that IS a trifecta. ;-) Ragout is awfully fun to say, isn't it? Thanks for the comment. Such a great fall dish. I think that I could go vegetarian (if I could have some bacon every now and again). I completely agree that many meat-free meals are completely delicious. Especially with the addition of meaty mushrooms and creamy beans. My hubby, a true meat lover, never misses it if there's mushrooms in the mix. This looks fantastic, I've pinned it for later in the week. Hi Debra, it's pretty hard to live without bacon, isn't it? :-) Thanks for the comment. Hi Kristi, mushrooms make any dish "meaty" IMO. This is a really good dish -- you'll like it. Thanks for the comment. Bookmarked! This would be a perfect meal for meatless Monday, or any day of the week. Thanks for sharing! Yum! It looks terrific, John! I'd love to try your ragout! I don't really like mushrooms, but I'd definitely love them in your dish! This is such a perfect fall meal. Mushrooms are so delicious and meaty, they make the best veg dinner! Hi Beth, this is such a terrific dish! You're right: perfect for any day of the week! Thanks for the comment. Hi Marcela, there are a lot of mushroom in this, so if you're not a fan, might not be your thing. :-) Thanks for the comment (and info about the new link). Hi Alyssa, this really is a great fall meal (winter, too, although I agree it's more fall-like). Love what mushrooms bring to a dish! Thanks for the comment. 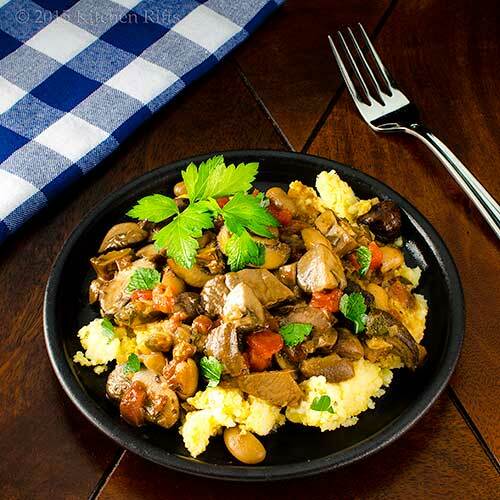 Love the sound of the mushrooms and white beans in this; will have to give it a try! Hi Caroline, this is really tasty stuff. Bet you'll like it! ;-) Thanks for the comment. Hi Smidge, your son won't miss his steak with this dish! :-) Thanks for the comment. Hi Amira, it does look like it contains meat, doesn't it? But all vegetarian. ;-) Thanks for the comment. Nice ragout with veggies when you want to just go meatless for a meal!! Hi Shibi, this really is nice. Not to mention tasty. Awfully, awfully tasty. :-) Thanks for the comment. Hi John, your this meatless dish look inviting and delicious. Looking at those ingredients, I'm sure its very flavorful. Thanks for sharing. Hi Raymund, this really has a full flavor. Very satisfying! Thanks for the comment. Hi Amelia, it really is extremely flavorful. Good stuff! :-) Thanks for the comment. I love how this is meatless and the mushrooms act like the meat! Such a great idea!! Hi Vicky & Ruth, isn't this a great meatless meal? Meat eaters will never miss the meat! Thanks for the comment. I am always looking for new delicious recipes for meatless Mondays and this is perfectly hearty and that is a good thing with my hallow legged boys. I love how mushrooms give a dish an earthy flavor and chewy texture. Loving your idea to use a black dish for this photo shoot. Brilliant and so vibrant and crisp, it makes your food pop! Hi Bam, black dishes can be pretty, can't they? Your boys would love this -- makes a big batch, and it's very hearty. Thanks for the comment. Well, I have next Monday's dinner! I'd make it tonight but just did beans last night. Plus: I still have fresh herbs (O happy day!) Who knew there were so many mushroom puns? Hi Claudia, those puns did mushroom, didn't they? ;-) This is really good -- and do try it with the polenta. Such a wonderful combo. Thanks for the comment. You two are the cutest couple joking with the food all the time! I wish I'm that witty! Love mushrooms. I can eat mushrooms as a main dish. :) This looks and sounds very good! I love mushrooms absorbing all the flavors and I bite into it... yum! Hi Nami, aren't mushrooms wonderful? We love them as a main, too. ;-) Thanks for the comment. Hi Dana, isn't this a terrific dish? So full of flavor! Thanks for the comment. Hi Kiran, easy and tasty -- my kind of dish! Thanks for the comment. Hi Anna, we really like vegetarian/vegan dishes -- if you know how to cook, they have so much flavor. This is a really good one. Thanks for the comment.